Jorge Posada is a painter, sculptor, print-maker and photographer who lives and works in New York. Posada has earned awards from prominent institutions including the Museum of Contemporary Art in Bogota, Colombia and the Atlantic Center for the Arts in Daytona, Florida. He was awarded a six year scholarship at the Lower East Side Print Shop and an Honorable Mention at Expresiones Hispanas Art tour USA. His artwork was showcased on Channel 13 in the documentary The New Immigrants. He created a 1.500 sq ft mural Homage to the Arts at the Ritz Theater in Elizabeth, New Jersey. 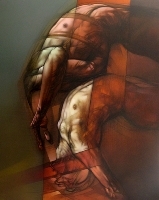 His art has evolved into a less realistic depiction of the human figure: a cross between figuration and abstraction. He masters a mixed-media of charcoal, acrylic and oil on canvas to create his compositions by building up transparencies of color. 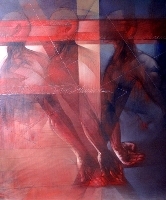 Posada works in series which address the human form in a dynamic and constant flux. 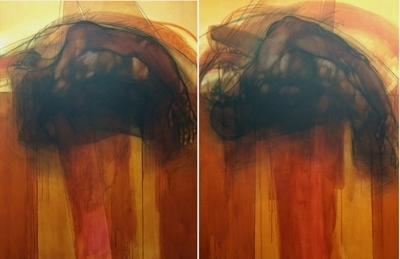 Posada's work is in mayor private and public collections in the USA, Europe, Japan and Latin America and has been published in numerous art books. The human figure, from the beginning of my career, has a very important role. Sometimes I depict it in a very realistic manner others only as a blurry suggestion of a human form but, always with the same intrinsic intention of explore its qualities as a vehicle of formal expression. I prefer to establish a visual dialog that ideally creates a communion of feelings and emotions between the public and my artwork.